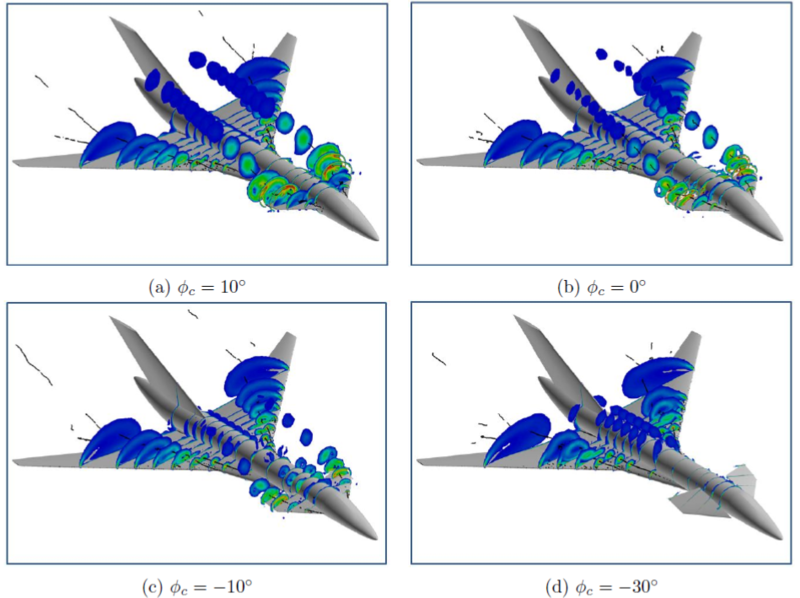 Computational Fluid Dynamics(CFD) simulations are anticipated to become the primary tool in the design of modern commercial and military aircraft. Specifically, CFD has become reliable enough to detect the source of undesirable flight characteristics experienced in the flight testing. However, CFD techniques are subject to inaccuracies and must be validated and evaluated on the basis of experimental data. Researchers at the US Air Force Academy have been using Cobalt to predict static and forced motion aerodynamic responses of a canard configured TransCRuiser named the TCR. In the process, they have also examined and validated the use of Cobalt’s Overset method to simulate canard deflections. In the wind tunnel experiments, the left and right canard panels were deflected in eight different positions including an asymmetric position. Regeneration of the grid for all these cases can be a very time-consuming and labor-intensive task. This work investigates the use of Cobalt’s Overset method for modeling the TCR canard deflection because an overset mesh allows for efficient grid generation for large displacements and surface deflections. The single grid for the TCR with and without canard is shown below as well as the overset grid for the canard case. Initially, the single grid case was compared against experimental data for the TCR with and without canard. The canard is not deflected. Normal force coefficient and pitching moment versus angle of attack are shown below. Very good agreement is obtained between the Cobalt data and the experimental data. Flow details for the TCR with and without canard for angle of attack = 18 is also shown below. The results of the overset mesh are compared with experimental data and those predicted by a single mesh at canard angle of zero degrees. This allows investigating the effects of the gap that exists between the canard and fuselage of the overset mesh on the aerodynamic predictions. Sweeps of angle of attack with and without canard. TCR single grid meshes. Flow details at Angle of Attack = 18. To validate the Overset method, the results of the overset mesh are compared with experimental data and those predicted by a single mesh at canard angle of zero degrees. This allows investigating the effects of the gap that exists between the canard and fuselage of the overset mesh on the aerodynamic predictions. The comparison is shown below. Comparison of single and overset grids for zero canard deflection. 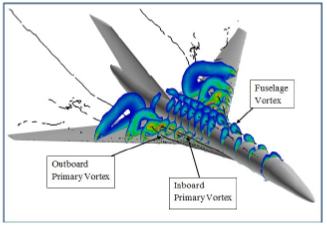 The overset mesh was then used to investigate and validate CFD data at different canard angles. These angles include ϕc = [-30◦,-10◦, 0◦, 10◦]. The normal force and pitch moment coefficients were compared with available experimental data. The results show that predictions from CFD using an overset grid method match very well with experiments. Note that the normal force and pitch moment increase with increasing canard angle. Validation of the overset mesh for canard deflections of ϕc = -30◦,-10◦, 0◦, 10◦. The canard effects on the TCR flowfield at 20 degrees angle of attack can be seen below. As the canard angle decreases, the canard vortex becomes smaller and therefore the fuselage and LE vortex become larger. Notice that at ϕc = -30◦, no vortex is seen over the canard. TCR flow solutions at α = 20◦ for different canard deflections. Iso-surfaces were created and colored by vorticity. The black lines show the core of vortices.